Bicycle-friendly amenities are contributing to a surge in property values TWEET in communities across the globe, marshaled by developments in urban centers and suburban outposts that accommodate “active” transportation. The draw to these trails, or networks, is primarily enhanced well-being, with the increased sense of safety—made possible by features like graded paths, protective posts and “bicycle boulevards” —especially appealing to bicycle commuters, who contend with motorists daily. The opportunity for outdoor physical activity has also markedly piqued interest. Big-picture implications arise, as well. The report points to significant increases in rents and retail sales, and a decrease (by the millions) in medical costs, all as a result of trail-oriented development. Many communities, however, lack access to facilities that fit the bicycle-friendly criteria. Nearly half of participants (48 percent) in a previous ULI study reported inadequate infrastructure to support cycling, though over half (52 percent) would prefer to live in an area without the need for a car. The cause of this imbalance is unclear. The funds needed to install a bicycle network are relatively modest: the report references Portland, Ore., which constructed a 300-mile bike trail for approximately the same cost as one mile of a four-lane freeway. Builders have begun to cater to the mounting demand for accessible development, but key members of the industry have yet to take action. Is there a bicycle network in your community? Do you promote it in listing descriptions? Share your experience in our comments section below. We have a fabulous trail in our Hudson Ma community that I run or ride on almost daily. Great expansion of trails through out Boston, Hopkinton , Natick and the greater Boston area. A commuter trail to Boston would be a dream come true!! Always highlight on my lsitings!! Between Greenville SC and Travelers Rest SC is the Swamp Rabbit Trail. And it’s expanding down to Conestee Park. That Trail has spurred amazing economic growth along it, increased property values and brought a lot of attention to the area. Because of it’s success, the neighboring towns of Pickens and Easley developed their Doodle Trail. Both of these bike/walking trails were developed on abandoned railway paths. A large percentage of potential home buyers visiting our real estate office in Orleans, Mass. arrive with two bicycles strapped on the back of their car. The popular Cape Cod Rail Trail, 22 miles long, cuts through Brewster, Orleans and Eastham. From the Cape Cod Rail Trail, connections lead to the Nauset Bike Path in Cape Cod National Seashore in Eastham, eight miles of bike paths in Nickerson State Park in Brewster, and the Old Colony Rail Trail, nearly 8 miles long, leading through Harwich and Chatham. Walkable and bikeable communities appeal to aging Baby Boomers, as well as Millenials. I lived in a community in Northern Virginia for many years which had long bike trails. You could safely ride into Washington, D.C. to work or recreation. When I moved to Southeastern Virginia I was terribly disappointed to see almost no bike trails, no bike lanes and no emphasis placed on bike trails as part of the planning process. I usually hate anything to do with exercise and my wife bought the whole family bikes for Christmas last year. I at first reluctantly agreed to go for a bike ride with the whole family thinking I would absolutely hate it. How wrong I was! I bike nearly every weekend and can’t get enough of it and now I run my own bike community. I had been in desperate need of losing weight when biking became my new hobby. Now, I ride to and from work every day. 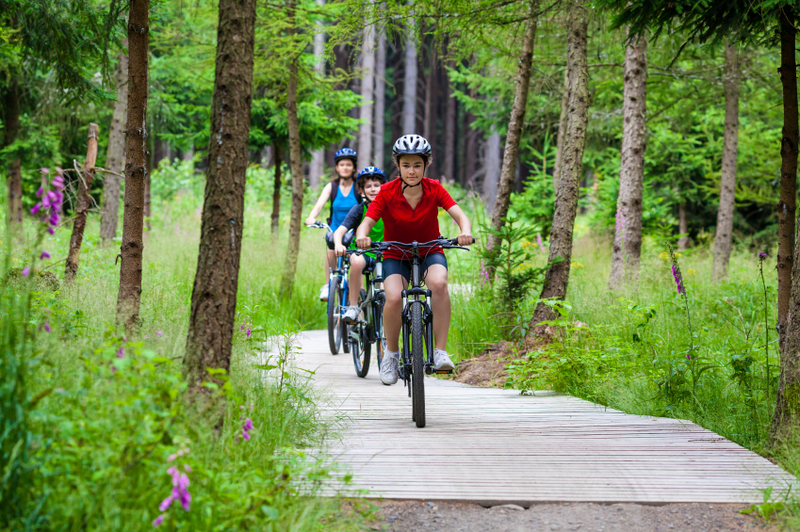 The bike trail goes through 10 miles of woodland area – it’s a fabulous start to the day! I would be lost without my bicycle , I wish they would build more bicycle routes for us in the UK!